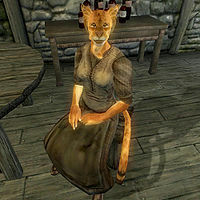 Shomara, a Khajiit farmer, is the youngest of the three sisters maintaining the Three Sisters' Inn in Leyawiin. She is the cook there, and Shamada is the hostess, but you need to speak to the eldest, Shuravi, if you want a room or a meal. According to Shuravi, Shomara is the least intelligent of the sisters, and she even refers to her as "dumb as a post". This might be the reason why Shomara spends as little time at the inn as she possibly can. After waking up at 6am she spends only two hours at the inn before she leaves for breakfast at the Five Claws Lodge. At 10am she will stroll around downtown Leyawiin until she returns to the inn for a two-hour lunch at 2pm. She leaves immediately after her meal and spends the afternoon strolling around outside until she returns to the inn for dinner at 8pm. She spends the last two hours of the evening loitering around near her bedroom until she finally goes to sleep at midnight. If it is raining she will cancel all her outdoor activities and stay inside the inn. Shomara wears a lower-class outfit consisting of a coarse linen shirt, coarse linens, and a pair of oiled linen shoes. She also carries a few pieces of gold. While she might not be dumb as a post, her greeting shows that she might not be the brightest of the sisters: "Sorry, sorry, sorry. Got to get cooking. I'm the cooking sister. I'm Shomara. The cooking sister." When asked about Leyawiin her wits becomes even more apparent: "I cook here. And live here. With Shuravi and Shamada. We're sisters. Three. Shuravi - one. Shamada - two. And me - three."